Luxury Apartment Corra II. is on first floor and fully air-conditioned. It is equipped with Wi-Fi internet connection and flat SAT-TV. Apartments Corra are situated in a new and modernly decorated house in Okrug Gornji on the western side of island Ciovo. . The house consists of 3 apartments (Corra I, Corra II and Corra III), one on each floor. 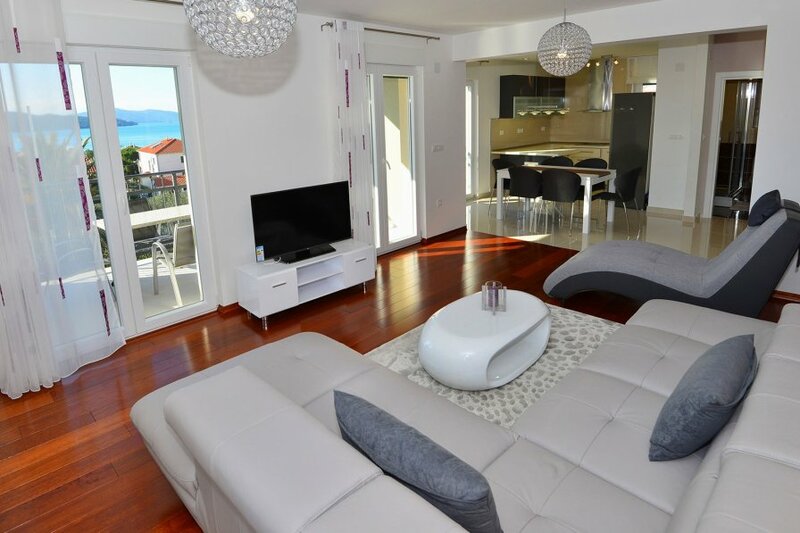 All apartments have 2 bedrooms, 2 bathrooms, kitchen, living/dining room and a balcony with a beautiful seaview and are equipped with air condition, flat screen SAT-TV and Wi-Fi. The apartments have a shared swimming pool (8m x 4m) and a big common terrace with lounge chairs for relaxation, making the guests feel like they are a in a small, but luxurious wellness resort. There is also an outside summer kitchen with grill and a dining table, ideal for social gatherings. Guests have 2 outside parking lots on disposal, while the indoor parking is available on request. Enjoy your stay in Apartments Corra and spend an unforgettable holiday on island Ciovo!